Today, inspired by my extremely thin wallet and an enticing coupon for Zoi Yogurt at only $0.79 a cup…I ventured into my local store for a label-reading safari! My pocketbook doesn’t often allow for individually packaged yogurt cups, and so…here was a chance to give my kids a treat. The question was…would the “SALE” option meet the high standards of this Mom? We’ve got an interesting set of food expectations. Some are based upon an asthma scare we had with my eldest, when he turned seven. Out of the blue, the kid couldn’t breath! The doctor checked him out and said something about drugs and nebulizers and inhalers, before I stopped him. The doctor blinked. Ten minutes later, my brave son watched as they drew vial after vial of his blood to be sent away to an allergy clinic in Florida. Ten days later, the results came back. My kid was allergic to about 30 different foods, most of which had been on our “health food diet” since he started eating food at age one. Until then, he nursed exclusively. Soy, most nuts, corn, cherries, wheat, all citrus, most nuts, even rice! Now, look back at that list again. Do you have ANY idea how impossible it is to buy pre-made food that doesn’t have one of those things in it? Corn, alone, is processed into over 200 different ingredients which are, literally, EVERYWHERE! Didn’t matter. It was time to fix my kid, and fix him we did. Two weeks into our new diet…his asthma was gone. We kept him off everything for 4 months. OMG. That’s all I’ll say. Then we started testing. For two years, he’d get an asthma attack anytime he ate wheat or cherries…after two years, he was pretty much over it. Super healthy gymnast, traceur, swimmer, skateboarder, you name it…he can do it. current labeling laws empower us to protect ourselves from. And so, I’m sure you can see why label-reading has become a well-honed skill in our family! Nowadays, our family is pretty strict about avoiding HFCS (high fructose corn syrup), Non-tilth certified organic corn or corn derivatives (because all the rest is generally GMO – including USDA Organic), rBGH milk, nitrates & nitrites, aspertame, preservatives, colorants, other fake sweeteners, hydrogenated oils, and most meat that isn’t raised by myself or someone I know. So…the question this morning was…can I buy the Zoi (which was cheap enough that I could afford it)…or not? The answer would come from one place, and one place only. After about twenty minutes, I had scanned multiple brands. Quite a few listed “sugar,” which could be from beets…did you know the sugar beet industry just decided to switch entirely to GMO beets? NONE of the yogurts listed HFCS & most prominently displayed the LACK of rBGH on their labels! But, many (especially the non-fat varieties) had corn starch. That’s a no-no, as it is almost certainly GMO. Of course, maybe it isn’t…but without GMO labeling, I am forced to guess. 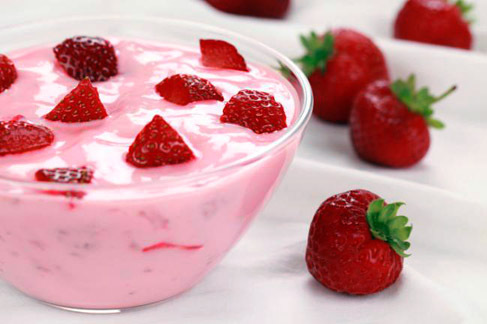 FAGE, of course, was the simplest with just milk and pro-biotics…but it’s plain and my kids want fruit flavors! Chobani, which was $1.49 a cup, was pretty good looking…but then I saw that it had “natural flavors” which is a catch-all term for a huge list of possible ingredients. Cascade Fresh was exciting, because it only had fruit juice sweeteners, but there was corn starch again! Damn! Finally, I was about to leave, un-used coupon in hand, when I leaned down to scan the superbly priced Zoi ingredients one more time. I COULD BUY MY KIDS YOGURT! Long story short. BECAUSE of labeling, Zoi gained a customer, Thriftway moved their product, my family saved $4.60 by being able to use a coupon, I’m enjoying the convenience of tossing a pre-packaged cup of yogurt at my kids (as they head out for daily CATS! rehearsals), and my kids are enjoying a special treat of fruity, store-bought yogurt! AND LABELING GREW A DAIRY BUSINESS. POWER OVER SELF IS FREEDOM.